A dual-rate setup remains on the rear shocks and was introduced to the fronts, along with crossover rings and new shock valving. Many sport UTV owners aren’t aware of the hard facts and level of maintenance that is involved in sustaining like-new performance while enjoying one of these insanely fun machines. Shocks are one of the chronically neglected parts of a UTV. We started with a fairly new Polaris RZR XP 1000 that comes stock with piggyback reservoir-type coil-over Walker Evans Racing shocks. Depending on how hard you drive, you should expect most stock shocks to need a rebuild or to be freshened up between 500 and 1500 miles. The rear tender springs on the RZR were already sacked out and in need of replacement. We sent the shock set over to Fineline Suspension in St. George, Utah, for a makeover. Fineline’s owner, Tom Rowan, used to work for White Brothers, and then started his own suspension company in 1993 specializing in dirt bike suspension. Eventually, the UTV market began to flourish, and Tom began directing efforts and experience into these roll-caged machines. Rowan doesn’t just slap new parts on your shocks and call it a day. He will work with your wants and needs and test your vehicle to make sure the setup is just the way you want it. It was time for a fresh setup for Andrew Dinwiddie and his wife Amanda’s Polaris RZR. If you want to understand more about the shocks and their setup, go to “Suspension Setup Tips” at the end of this article. The RZR’s WER shocks come with a single progressive spring on the front shocks and a dual-rate setup on the rear. Fineline started by taking the shocks apart and changing the shim stack inside for both compression and rebound that complement aggressive trail riding and dune running. Next, the front progressive rate springs were tossed and dual-rate springs were installed. Dual-rate springs employ a large, stiff spring to tackle big hits and a smaller tender spring up top to soak up the chop. A crossover ring was installed above the main spring, so when the suspension compresses past the top tender spring’s capability, only the main spring will be in action. This also helps bottoming resistance. The main springs on the rear shocks work just fine, so they didn’t need replacing. However, the tender springs on top were weak, so Fineline installed new tender springs and also a crossover ring. Fineline’s crossover rings are slimmer than those of other shock builders, so you get less spring rub on them. However, you will always run into spring-rub wear with shocks, and a minimal amount isn’t anything to worry about. 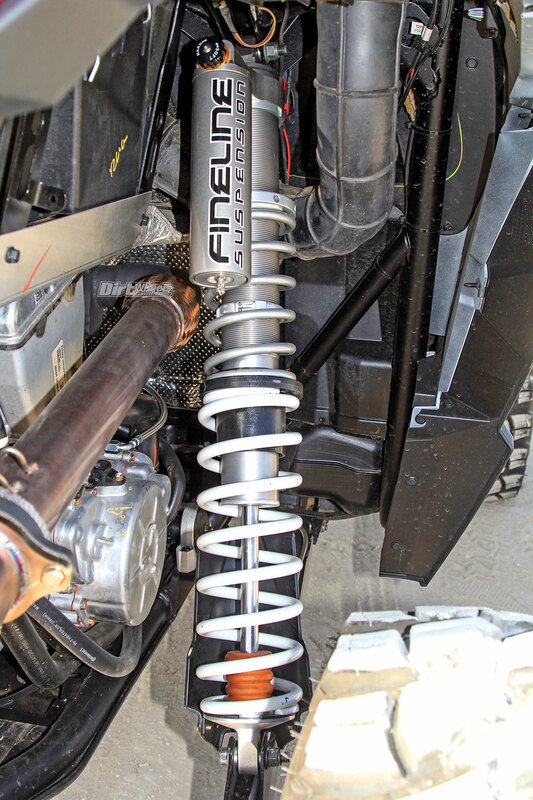 The Dinwiddie’s Polaris RZR XP 1000 now has a more supple yet aggressive shock setup thanks to Fineline Suspension’s skills. The Dinwiddie’s love to hit the trails and are no slouch on the throttle. Both wanted a plush ride in the deserts and dunes of Southern California, and that is what Fineline Suspension provided. The bottoming resistance was much greater, and the new tender springs assisted with softening up all the chop and chatter bumps. 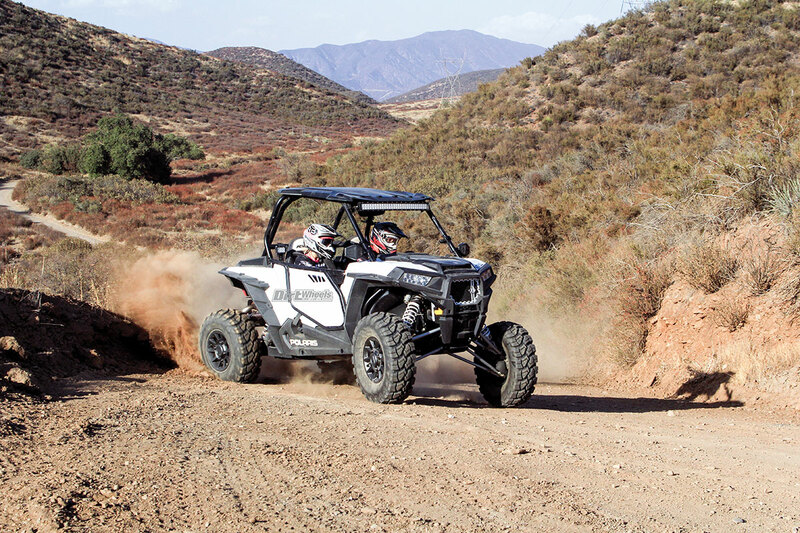 The RZR didn’t wallow in corners and had better all-around control. Andrew and Amanda can now get out of their Polaris without feeling sore from the abuse of the stock setup. Getting your suspension dialed in also helps your ride gain more traction, which is a plus for those of us who love to go fast. 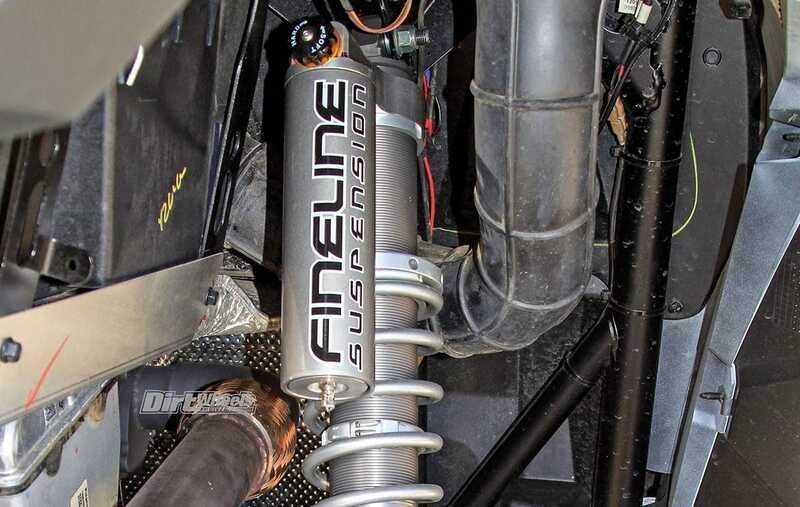 This Fineline setup starts at $1200, but depending on what your specific shocks may need, the price increases. That is a very competitive price for the work done, so we certainly would recommend Fineline to anyone wanting a better ride for their rig! Call (435) 229-2784 to get a quote and follow them on Instagram @finelinesuspension.